I’d read about the Mega CD in Sega magazines but hadn’t seen one, then I brought a promotional video tape from a boot fair of all places and the Sega marketing team had done a great job because after I’d watched the tape I wanted a Mega CD. As they didn’t sell to well here in the UK it was hard to find one after the high street shops had sold there initial stock however I did see one in a second hand shop just round the corner form my home and it was mine for £90 so I decided to blow my savings and get it. I never did get to play Night Trap one of the games demoed on the video but I did get to play some really unique interactive video style games like Sewer shark and Area 51. The Mega CD came with Sol Feace and Cobra command in the box, neither game really showed off the advantages of having a CD-ROM based system. You could play CD & CD-G discs through the system but I rarely did as the sound came through my TV speaker which wasn’t great. The Mega drive piggybacked the Mega CD and had an expansion slot on the side to connect the to devices, and they had independent power supplies. A fun console that I could never find any games for, if only eBay was around back then! I think it’s cost new prohibited large European sales, which is a shame as it did have a lot to offer. Poor old Sega it was all down hill from there wasn’t it? Nintendo have been bounding back into the gaming industry since the success of the DS Lite and the huge response to the launch of the new Wii console. Last weekend I was in the game store in Canterbury, there was a sign in the window “We still have some DS Lite available” inside was a smaller hand written note, we have 6 DS left?, in the fifteen minutes I spent in the shop I watched the manager changes the sign a few times 4 left, 2 left and as I was leaving the main sign in the window was coming down. Nintendo’s new products are really selling strong in Europe this Christmas I can only see good things ahead for the company. Reports of a shortage of component cables for the Wii have caused a lot of buzz on the gaming forums and podcasts. I guess as the Wii isn’t HI-DEF Nintendo thought it wasn’t necessary to include these in the box but it’s kind of surprising these aren’t readily available at launch as most earlier adopters are going to be techie types that have HD equipment and want the best quality display possible. Also I thought extras such as cables are the main money makers, Sega and Microsoft certainly went for this business model. Even if the Wii is a Game Cube with a new controller, as a piece of hardware it sure looks good, and if the games work well with the motion catching controller Nintendo could be sitting on another DS like gold mine. Things have changed a lot since the heydays of the SNES but it’s good to see Nintendo is doing more than just hanging on. I’ll be interested to see which online multiplayer games go on sale in 2007. Road Blasters was converted form the arcade to the Spectrum.Â Â I played the arcade version a lot while on holiday at Butlins in Bognor Regis.Â When the adverts went out for a home version I couldnâ€™t wait to get it.Â Experience again the holiday magic without having to keep putting 20p coins in to keep playing!Â The game can best be described as Outrun with guns.Â You have to drive to the end of each stage without running out of fuel, which can be collected from green orbs opportunely sitting in the road.Â Make sure you collect all the fuel orbs as it can get a tad infuriating when youâ€™re inches from the finish line and run out of fuel. Now on to the blasting bit, you had a standard gun with infinite ammo to quickly dispatch other cars and motor bikes that insist on getting in your way.Â But the real magic comes from the special weapons delivered to you by what looks like a NASA space shuttle that hovers over your car, you have a limited time to collect the roof mounted weapon treat before the shuttle flyâ€™s off.Â Because the special weapons are so hard to come by it makes them all the more fun to use! There are also mines to look out for but you do get a warning on your dashboard when youâ€™re entering a mine ladened area.Â The loading time from cassette was about 10mins but itâ€™s worth the wait. I played this on my mates Sinclair Spectrum, before I had my own. He had a black and white TV although it didn’t seem to matter in those days. The full game came free on Sinclair User magazine. You (Dustin) were in prison and had to find your way out avoiding the guards and some of the not so friendly prisoners. The game had a fair amount of rooms to explore with different charters inside. I don’t recall ever managing to get him out of the prison but I got quite good at beating the guards up! The trick was to give the keyboard a really good hammering. I had the Spectrum +3 brought as a Christmas present in 1987. My parents probably thought it would be used to do school work on, but like most kids I wanted it to play games! I remember my Dad brought the computer from Comet it came with 20 games on two double sided 3â€? discs and two quick shot joysticks. Amstrad brought the rights to the Spectrum from Sinclair Research in 1986 to gain a larger portion of the home computer market. Sir Clive set up Sinclair Vehicles and used the cash from Amstrad to fund the C5 project, unfortunately this didnâ€™t work out too well. The built-in tape drive of the +2 had been upgraded to an Amstrad 3â€? disk drive. Although there didnâ€™t appear to be many software titles available on 3â€? disc loading games were a great deal quicker than tape, 30 seconds instead of 5 minuets. The power supply was huge and got quite hot, great for keeping your feet warm though. I built up quite a collection of games for my Spectrum as they were easily affordable at pocket money prices, most weekends Iâ€™d go to down to John Menzies, Boots or WH Smiths and get a game. Always falling for the Amiga or Atari ST screen shots on the back of the packaging, thinking the game would look that good on my system. One of the best features of the Spectrum, was the ability to program it yourself. Magazines like Sinclair User, Crash and Your Sinclair would publish code for you to try out. I spent many hours programming, just make sure you save your work before running the program, if youâ€™ve made a mistake and it crashed youâ€™ve got no way of getting back to your code. Great stuff. 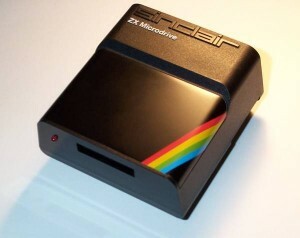 Date storage system for the ZX Spectrum, providing an alternative to standard audio cassette. Although still a magnetic tape it spooled through a cartridge at speed allowing much faster data transfer. Unfortunately Microdrive cassettes were particularly unreliable, as one game developer found out when they lost months of work by backing up to one! The game was still released but as the whole thing had to be recoded it didn’t get the same level of graphics detail as originally intended. I never managed to get the Microdrive to work, a friend gave me his and it fried my Spectum +3 power supply! A friend of mine got one of these famous grey boxes for Christmas, I think I spent most of the Christmas holiday round his house!Â It came with Mario and Duck hunt on one cartridge.Â He also had Zelda on a gold cartridge that had the ability to save your progress to.Â Silent service (1990) was one of my favourites a submarine simulator, unusual game especially for the NES famed for its platformers.Â Nintendo released a Robot or R.O.B with some of the early systems although I donâ€™t know if this was ever available in the UK.Â I think there were only a couple of games for it and it turned out to be a bit of a gimmick but then Nintendo have always been innovative, doing something different to the rest of the industry and their still doing it now with the touch screen on the DS Lite and the motion sensitive controller on the Wii.Â The NES appeared revolutionary at its release with great sound and graphics and instant loading from cartridge this really was leaps and bounds more advanced than my humble Sinclair Spectrum. First tape game I brought after getting a cassette player for my Spectrum +3. A 48K version on one side of tape and a 128K version on the other. The only difference I could tell was the 128K version had a speech sample when the game first loaded announcing the title of the game. Impressive feat considering the hardware limitations. You girlfriend Daisy has been egg napped by Zak and you have to get her back. A relatively easy game to play through and the first Dizzy to introduce other members of the Dizzyâ€™s family, the yoke folk. These guys help you through the screens by giving you items. Part of the game includes a trip to Australia where the playing area is flipped upside down, you could make this a bit easier by turning your T.V upside down ! Repeating the coin collecting from Treasure islands Dizzy once Daisy has been rescued you need to collect 50 coins to pay for your new home to live together in. Dizzy was a very successful series with 8 adventures and several spin off titles. See http://en.wikipedia.org/wiki/Dizzy_series for more info. Sinclair User magazine carried a demo of this game letting you play the first few screens.Â The full game was very unforgiving as you only get one life.Â This time dizzy is stuck on a desert island and needs a boat to get home, there is a shop that will provide you with a boat in exchange for valuable items spread across the island.Â These include cursed treasure, a video camera, a microwave oven from Black Beards secret kitchen and so on.Â Each item will get you a bit closer to leaving the island.Â First you get the boat, then an outboard motor, next some fuel and finally a key to start it.Â So you finally leave the island on your boat only to land up at another island where the shop keeperâ€™s brother is waiting demanding a toll to pass, so now you have to go back to the first island and collect 50 coins hidden in all sorts of weird places, behind a tree trunk, in a fence railing.Â Iâ€™ve managed to find 49 of the 50 coins but thatâ€™s it, so close to beating this game. The first Dizzy game set the formula for the entire series. Dizzy is an egg with boxing gloves, Dr Martin boots and he can summersault egg over heals. Collecting items to get through obstacles on each screen, such as wearing a rain coat to walk under acid rain using, or using a dry ice canister to freeze a lake allowing you to walk across it. The main objective is to collect ingredients to make a potion to vanquish Zak the wizard your adversary throughout the dizzy games.